Specifically developed for today’s 1000 cc to 1400 cc, high-performance sport machines. High-quality components coupled with a factory-greased seal ring ensures superior rigidity. High-tensile steels used throughout the chain components; larger pins mean loads spread out over a wider area, resulting in longer life and more strength. Specially controlled heat treatment means tougher material for more durability. Average tensile strength of 11,200 lbs. Note: This chain must be correctly matched to the machine size and power output. Failure to do so could result in failure of the chain, causing damage to the machine or other property, serious injury to the rider or others, or even death of the rider or others. 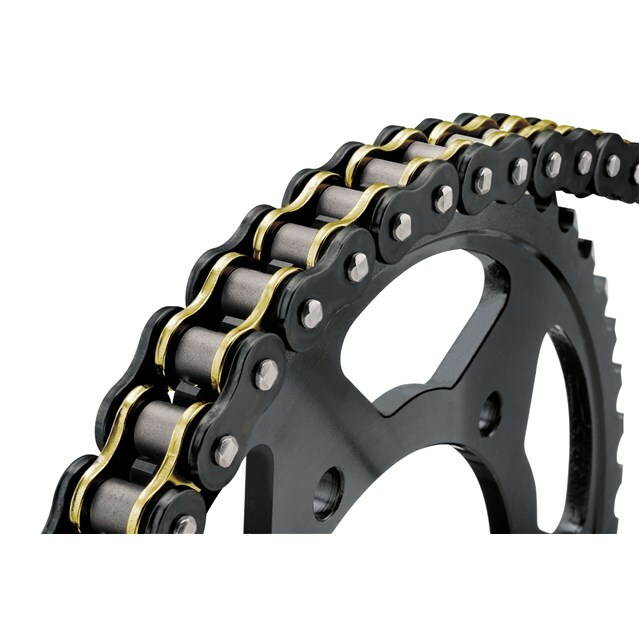 It is the responsibility of the installer to ensure that the chain selected is correctly matched to the machine and installed correctly. If you have any doubts, contact a professional before use.